Video game designer Daisuke Ishiwatari is best known as the creator of the fighting game series Guilty Gear. A multi-talented artist, he not only serves as a video game designer but also as a score composer, having written the score for BlazBlue. 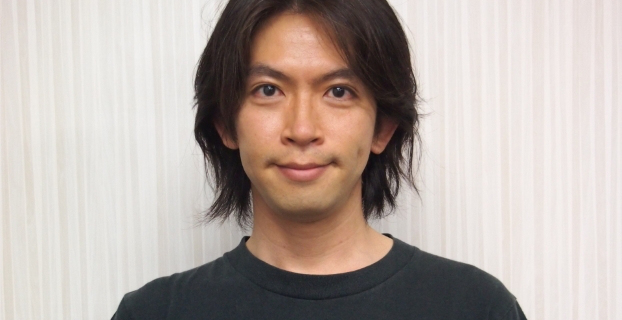 He also provided voices for characters in Guilty Gear. Jeremy Booth interviewed him at Anime Expo 2015. This interview was edited for clarity and concision. Question help provided by Dan Campisi. You were born in South Africa, is that correct? What was your family doing there? Yes, in Johannesburg. They were there for work. How long did you and your family live there? I’ve lived there twice: the first time when I was born, and right after that we immediately returned to Japan. Then I was there again from the fourth year of elementary school to the second year of middle school. So are you technically South African-Japanese then? At the time, I had dual South African/Japanese citizenship, but when I was taking my tests for college, I got a conscription notice from the South African army. I threw away my [South African] citizenship then. How would you describe the culture in South Africa compared to Japan and here? Do you have a lot of memories? First of all, when you hear “Africa” you don’t think “big city,” but [Johannesburg] is a very big city. We were Japanese, but since we were living mostly with Caucasian people, it felt kind of like England. Moving on to your gaming work, you’ve done a lot of jobs from music creator, character designer, voice actor, director…what would you say your focus has been in the past few years? Which role is your favorite? What I’m doing now hasn’t really changed much from the past, but one thing has changed: I used to do a lot of the graphics [myself], but now I hand that over to the lead artists. In terms of favorite–I like everything. I also understand you’re a big fan of western RPGs like Diablo and Fallout. What is it that you like about them? I love them. I haven’t been playing them too much recently, but when I first put my hands on them, one thing that really clicked with me was the sense of freedom you got from those games. Kind of a sandbox environment where you can do a little of everything? Your expertise is on focusing on being the best at fighting games. Where do you see the future of fighting games heading? For me personally, if the genre were to change anymore, it would no longer be “fighting games.” For instance, there’s Super Smash Bros, and if you were to ask me if that was a fighting game, I would say it’s not–it’s different. But, that being said, I think that within the genre, there are things that haven’t been discovered or invented yet, and discovering those things is part of our mission. In 2012 you said in a Gamasutra interview that you wanted to see that the genre kept evolving. How has your thinking changed since then? It’s a really difficult question, but for a long time, I’ve really wanted to see a game where players used their own physical strength inside the game. But maybe if that kind of thing were to happen, it may no longer be the same thing. 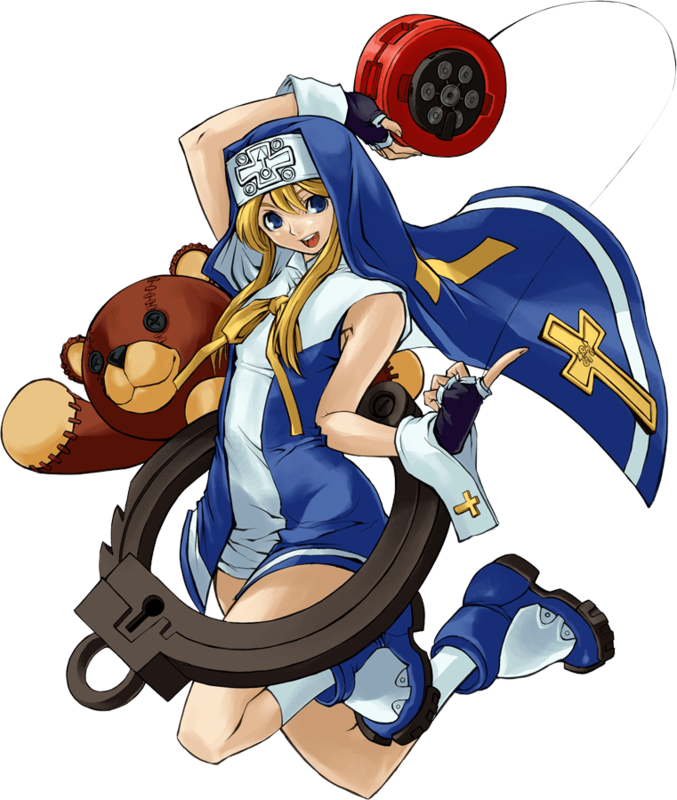 In Guilty Gear, there is a character called Bridget. Bridget is considered one of the first transgender character in games. What was the process of creating Bridget, and what inspired you to make the character transgender? I guess I couldn’t pin the inspiration for the character on any one thing. But when we are making new characters, we are always looking for some new element to add to the character to make it interesting and fun, and while we were making Bridget, that was the element. Did you realize it was a milestone when you did it? I wasn’t thinking about; I didn’t realize. There’s a fan debate on how to pronounce “BlazBlue.” What is the correct way to pronounce it? So in Japan, we pronounce it “Blay-Blue.” In other countries, the pronunciation is “Blaze Blue.” Mori [Toshimichi], the gentleman who worked on BlazBlue, he really liked the sound of “Blay-Blue”, but when it came time to localize to other countries, he was told there was no way that would work.